We all know about not buying gladWrap, reducing plastic bag use and saying no to straws. But have you thought about how much plastic is part of your bathroom regime? Probably like you, I’d like to improve my carbon footprint on the planet in 2019. When you add up your own usage, it becomes completely understandable why, according to National Geographic, there are over five trillion pieces of plastic currently in the ocean. Of course, it's not the only industry to blame, but the beauty world does contribute heavily to this problem (not only with excess, hard-to-recycle packaging but also more hauntingly with single-use products such as face wipes). What are naked products I hear you ask? Well, they’re freestanding no-waste products which do not need to be contained in a plastic tub, bottle or pot. When it comes to packaging, less is more, and none is even better! No plastic tubs and no extras. What you see is quite literally what you get. If you can’t find what you need with a naked product, your next best step is to find a makeup or beauty company who collect and recycle their packaging (like Margaret Hema), or re-fill them (like the Body Shop) or offer you an incentive to return empties (like MAC does with their lipsticks - return five, get one new one). However for many environmental reasons naked is, in my opinion, best. Since I was a teenager, I used to visit the Lush shop in the Old Bank Arcade in Wellington. Recently, with all the talk about reducing waste, I remembered Lush’s naked products (I’ve always used their bath bombs) and thought about revisiting the idea of supporting plastic-free more by swapping out my bathroom basics for naked products from Lush. 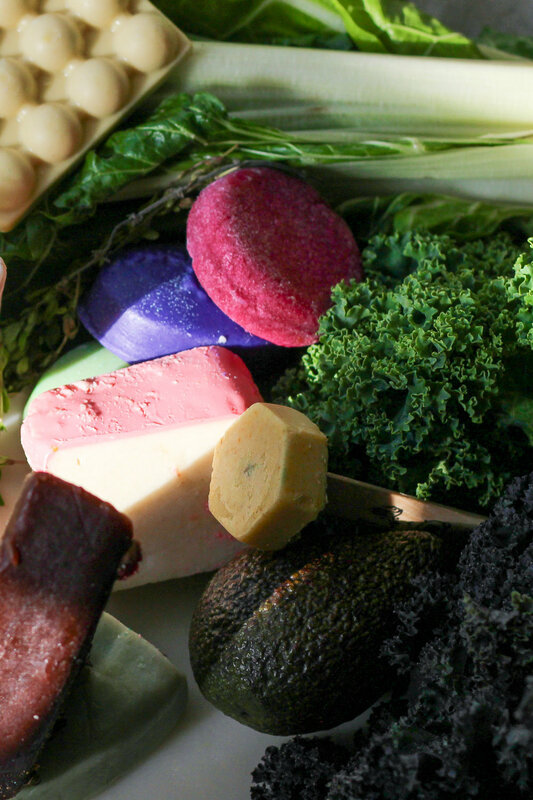 Lush has always been an innovator when it comes to transparency and sustainability in the beauty industry. They don’t test on animals and have a laundry list of other virtues to add their brand name. 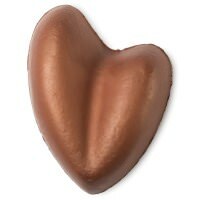 Their products are non-toxic and they work hard to campaign for important charities. However, I was most keen to understand how the company hits the mark with their wide variety of solid product formulations. I asked to have a in depth tour of Lush’s products and was shown around their Wellington store by the gorgeous Charlie. I found out that 35 percent of Lush products are packaging-free, or as they say, ‘naked’. This means you can buy body moisturisers, serums, face washes, self tanner and even hair treatment that are not packaged in anything apart from a little bit of wrapping paper (recycled of course). The solid ‘naked’ inventions are formulated with little to no water. This means that they are made without any synthetic preservatives. It’s easy to reduce your plastic waste by choosing naked cosmetics like shampoo bars, solid conditioners, soaps, scrubs, massage bars and bath oils rather than buying their packaged counterpart. I don’t like how they feel/work - can I still buy from Lush? If you do prefer the packaged version - it’s all ok! Lush packaging is recycled, recyclable, reusable or compostable. You can also bring back the pots to the store and get a free face mask if you collect four or five . There are other companies who have solid products, such as Ethique which is a New Zealand brand which is awesome. The more the merrier, right? Below you’ll find my pick of naked, and some non-naked products, which can help you reduce your environmental impact. If you do opt for packaged versions, please, please, please take them back to the shop to be recycled. If you do, Lush will give you a free face mask. The Big Sleep Bath Bomb Jelly - For the balancing and calming lavender and neroli oil - because I love to spoil myself when I got to Matts parents or on holiday and I can have a bath (I don’t have one!). This creates a jelly film on the bath which is super fun to play with. Green Coconut Bath Bomb - Because its sometimes wonderful to imagine being in Thailand in your bath. Karma Shower Bomb - I can do bathbombs in my shower!! 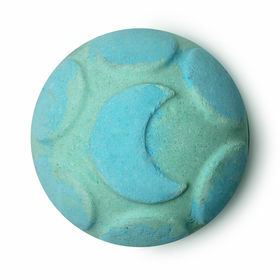 Karma is one of my all time favourite smells from Lush! 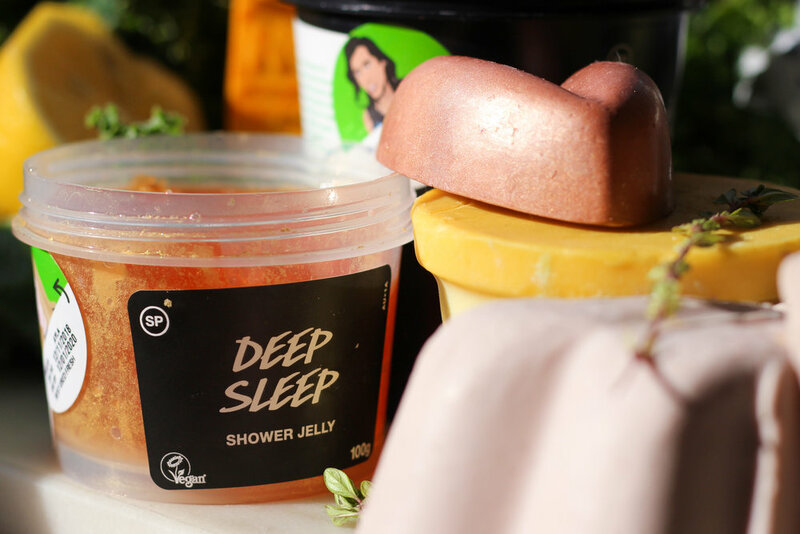 Soporific Sunset Shower Jelly - An amazing jelly you can hold which stays solid in the shower for you to rub all over your body. Ros Argan Soap - This looks and smells incredible. Rose is a beautiful feminine scent that is uplifting and joyfilled. Olive Tree Soap - This is a great unisex soap that is hydrating and balancing with coconut and plenty of olive oil. Lemon Bubble Brush Bath Bomb and Candy Bubble Brush - So much fun - they colour your bubbles! Ro’s Argan Body Conditioner - This is an amazing leave on moisturiser for your shower. If you forget to moisturise your body 365 days a year, like me, this could be for you. 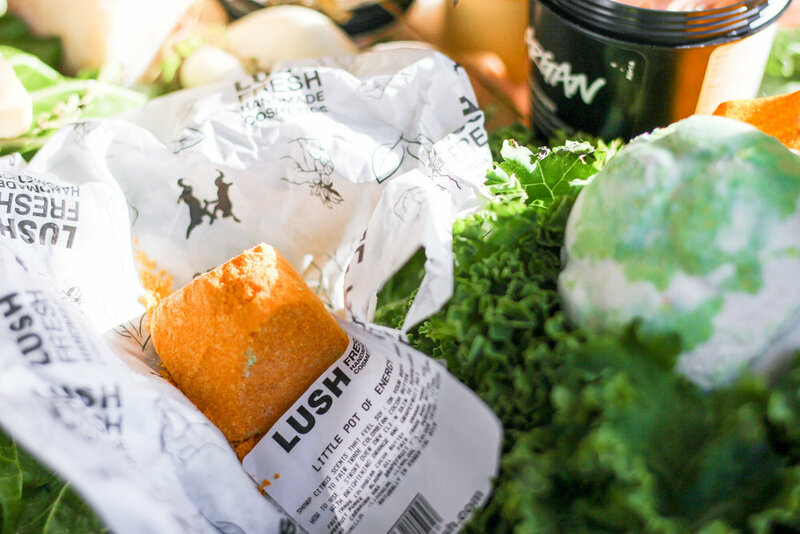 The packaging can be saved and returned to Lush to be recycled properly. Angels on bare skin - A crumbly play-dough like face scrub where balancing lavender entwines with restorative chamomile blue and rich kaolin. Again, keep the container and take back to Lush to recycle and get a free mask! Fresh Farmacy - A truly calming solid cleanser which conditions as well as cleanses the skin with chamomile, elderflower, calamine and lavender. Of course, I love that this amazingly is solid and has zero packaging. Full of grace serum bar - This is a really great Portobello mushroom based travel serum, which you could use all year around but I can imagine being perfect for camping or going outdoors. Love that Lush thought to make a serum solid - genius! BB Seaweed - Who could forget the famous Lush Facemask? This one is made with fresh seaweed, ground almonds, rose absolute and aloe vera to soothe and soften the skin. Don’t forget to store in the fridge! Jason and the Argan Oil - Love the name of this one. 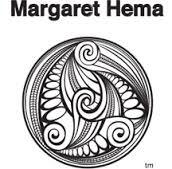 It has repairing argan oil and geranium oil to balance. Beware it does soften quickly so keep it in a box outside of the shower or a waterproof container. Avocado Hair Wash - I picked this one because it looked like cheese (nuff said). It is another great solid shampoo which is super hydrating and packed with loads of avocado. Trichomania - A coconutty hair wash to drift away to the tropics on. Sugar Daddy-O - A Purple Conditioner which is perfect for your blonde mane. Jungle - A conditioner for those who need moisture to tame wild hair (aka me). Marilyn Hot Oil Treatment - A brilliant solid hair treatment you boil in hot water and apply to your hair for max softness and condition. King of Skin Shower Moisturiser - Truth? I ended up using this out of the shower. But it is SO GOOD. I love how it just melts into my skin! Shimmy Shimmy - This sold body moisturiser is gorgeous and leaves a stunning shimmer all over skin. Beware if you need to avoid glitter. Fun fact - all Lush glitter is natural and can be eaten by fish! Hottie Massage Bar - This massage bar has nubs on it to massage out your athletes knots after a hard workout. It is an amazing and luxurious alternative to a solid ball or roller. Black Stockings - This is a solid self tanner delivers a golden glow which washes off when you’re done. Perfect for last minute evenings out! Aromaco Solid Deodorant - This is really nice and a fun packaging free alternative to your normal deodorant. Most importantly - it works. Little Pot of Energy Moisturiser - Don’t be fooled by the pot shape and name! This beauty is packaging free too. It delivers a bold of citrus energy charged with Cocoa butter to the body in solid form!